ALUFLEXSTAR is a series of Pumice or Aluminium Oxide scrubbing brushing machines for printed circuit boards. Aluflexstar is available in Compact and Modular range for rigid and flexible boards. This range of machines is ideally suited to prepare the copper surface for the subsequent adhesion of dry-films or soldermask coating. Compact and Modular lines, complete of external or internal slurry tank, for the use of Aluminium Oxide or Pumice, in a range of 650 (25,5”) and 760 mm. (30”) maximum panel width. The strong self supporting structure, three millimetre thick, is totally constructed in Stainless Steel and available from left to right or right to left conveyor direction. The basic Aluflexstar Compact machine is composed of an input conveyor, a brushing section with 3 or 6 couple of brushes, four rinse chambers and dryer. 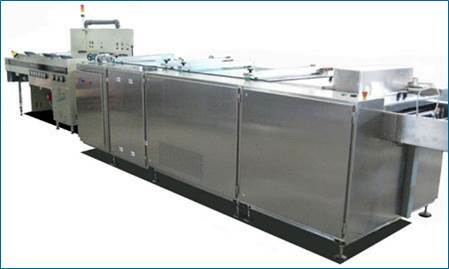 The Modular design offers the possibility of adding various modules to the rinsing chambers, like Ultrasound and/or Super High Pressure modules, for more complex processing line. Aluflexstar series increased with the new Aluflexstar POLAR version, a modular version suitable to process only panel from 0,1 to 4 mm. (.004” to .150”) thickness, at considerably lower cost. The same has the possibility to add various modules and different dryer for a complete line.